There is a fear shared by international society that populist leaders are dragging global efforts to keep the world’s temperature under the 2 degrees Celsius goal. One of the major accomplishments from the recently ended COP24 was that the 196 governments reached an agreement on a rulebook for implementing the Paris Agreement. Yet with the United States and Brazil, as well as Saudi Arabia, Kuwait and Russia stepping back on this joint climate action, the future of global climate governance does not seem so promising. Populist leaders in the United States, Europe, Latin America and Asia have several features in common, for example they put (what they considered as) national interests as their first priority and reject elite politics, international treaties and globalization. However, when it comes to climate change, the populist leader in the Philippines – Rodrigo Duterte – shares a somehow different attitude compared to his fellows in other regions. Instead of denying and dragging down the Paris Agreement, Duterte has been a strong advocate for global climate action. Prior to COP24, Duterte, as the chairman of the Philippine Climate Change Commission (CCC), had repeatedly stated that climate change was the top priority of his administration and his government is committed to protect the country from climate change challenges. The head of the Philippine delegation to COP24 and the vice chair of the CCC, Manny de Guzman, stated that the mission of the delegation is to “work together with the international community to raise awareness and to mobilize support to come to innovative solutions for achieving the goals of the United Nations Framework Convention on Climate Change and its Paris Agreement.” Meanwhile the U.S. delegation was busy promoting the use of coal and the Brazil delegation was contemplating how to develop the Amazon, the world largest rainforest. Does this mean that international climate action could still be embraced by populist leader? Yes, but only when climate change challenges are so present in the country. The Philippines is one of the most vulnerable countries and prone to extreme weather events. In recent years, the country has suffered badly from typhoons that struck more frequently and more severely, especially Typhoon Haiyan (known locally as Typhoon Yolanda) that was responsible for more than 6,300 casualties and more than 4 million displaced citizens and $2 billion in damages in 2013. In addition to increasing tropical cyclones that make landfall, the threat is exacerbated by where typhoons hit the hardest. In the last decade, the path of typhoons has gradually moved to the north of the Philippines and hit the communities with least resilience and protection. Hence, unlike other populist leaders holding a hostile attitude toward international climate negotiations, Duterte recognizes climate change is a “day-to-day problem” and has great impacts on the extreme weather events in the Philippines. However, through examining Duterte’s climate change framing, it is clear that he considers industrial countries responsible for causing the warming of the globe and the Philippines is the victim. Furthermore, he has called on industrial countries not only to significantly reduce their carbon emissions, but also, most importantly, to provide assistance to developing countries in terms of finance, capacity building and technology transfers. It is relatively easy for the president to point finger at the developed countries for climate change, yet little action has been carried out to reduce the carbon emissions of the Philippines under his administration. The Duterte administration pledged to take substantial actions required to cut emissions by 70 percent below business-as-usual (BAU) by 2030. Uncertainty surrounds the question of how this goal will be achieved. According to the Climate Action Tracker, there is no clarity around climate change mitigation plans or on the scale of finance that would require to achieve this ambitious goal. Moreover, Duterte has been holding a very strong pro-coal position and has approved at least 27 more coal-fired power plants. Studies also suggest that there has been a coal boom in the country, with 10,423 MW of largely imported coal in the pipeline plus the existing coal capacity of 7,419 MW, ranking it as the 10th in the world for planned coal-fired capacity. The reluctance to phase out coal might be related to the fact that electricity prices in the Philippines are already among the highest in Southeast Asia, and any measure to replace cheap coal might turn people against the current leadership. However, it is ironic to see that Duterte projects himself as guardian of the Paris Agreement in front of the international community while holding even tighter to coal consumption in its own country. Yet, there might be a blessing in disguise, the Philippines is one of the most bountiful countries for renewable energy, especially geothermal, wind and hydro power. 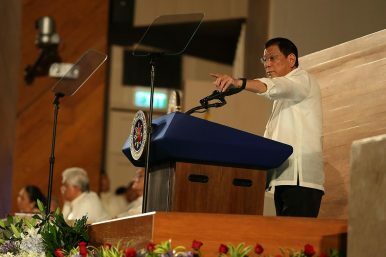 Unlocking the renewable energy potential in the Philippines depends on whether the president can be more sincere and more determined to keep his words to his people and to the international community, as well as to implement policies that incentivize the fast and smooth energy transition. Milan Chen is a PhD candidate at Technical University of Munich working on climate change politics in East Asia. She is currently a visiting research fellow at Harvard university. Special thanks to the Carnegie Council for Ethics in International Affairs’ Asia Dialogues Program and the Henry Luce Foundation for supporting this research on climate change in the Philippines. Environmental Defenders Under Pressure Across Southeast AsiaWhy Duterte’s ‘Stupid’ God Remark Wasn’t a Smart Idea in the PhilippinesDuterte’s Drug War: The Local Government DimensionDuterte’s Unfinished Wars in the PhilippinesDuterte Places Philippine Island of Mindanao Under Martial Law. What Next?